The case, in platinum, measures 44mm. It has an AR-coated sapphire crystal, a sapphire display back, and it is water resistant to 20 meters. Movement is the Swiss manual-wind AP in-house caliber 2936 with 28 jewels, 21,600 vph and a power reserve of 72 hours. 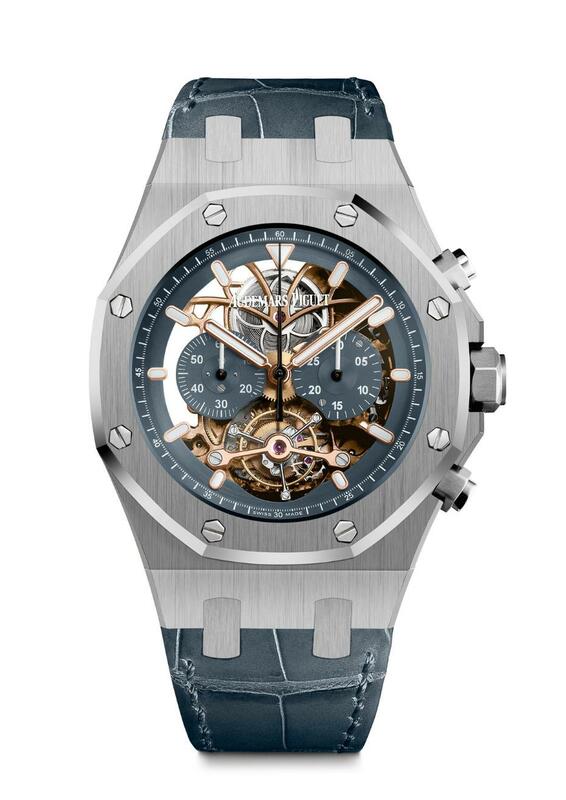 Functions are: hours, minutes, small seconds, chronograph, tourbillon. The dial is blue, openworked, satin-brushed, blue counters, rose gold applied hour-markers and Royal Oak hands with luminescent coating, blue inner bezel. It comes on a blue hand-stitched "large square scale" alligator leather strap with a platinum folding clasp.